Each month when trying to pick a plant of the month the most important factors are are they in season and are they readily available. 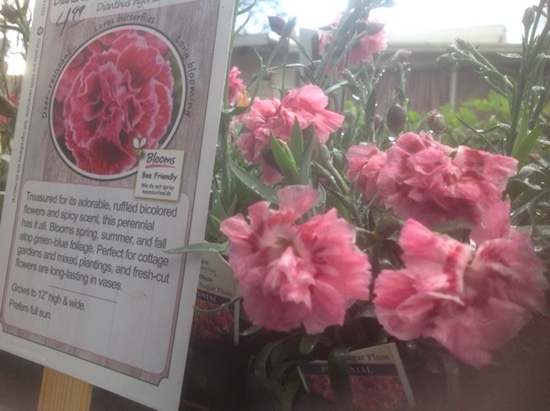 This month’s choice is Dianthus. Dianthus is a genus with over 300 natural species and countless hybrids. It includes favorites like Sweet William and Clove Pinks (aka Carnation). Flower colors are on the warm spectrum, like pinks and reds, but they come in whites and bi-colors too. Some are very close to the ground forming tight mats while carnations have more height and sprawl a bit. Foliage color can vary from green to blue green and grey green. Dianthus do surprisingly well here and are even deer resistant. Carnations are from the Mediterranean and Sweet Williams are from Southern Europe so are climate appropriate. They do like fast draining soil, not heavy, hence all you Hidden Valley people should amend the soil or grow in containers. They do not like acidic soil so amend with lime if necessary and do not overwater. They make excellent cut flowers and can have a spicy clove-like fragrance. They are easy to grow perennials in sun to part sun and are worthy of a spot, or several, in your garden. Right now they are available in 4-inch pots, but we often have 6 packs of Sweet William and bedding types. Winter has finally arrived (snow in the Sierras) just as we are set to start spring hours, being open 9-5, 7-days a week. Rain days 10-4. The weather has been a little shocking after all the warmth but a relief for us too. We were afraid the bare root season would be cut short. As it is, we put our bare root roses under plastic to try to keep them hydrated. The sun and wind were desiccating (drying out) the canes and we were going to have some serious dieback. 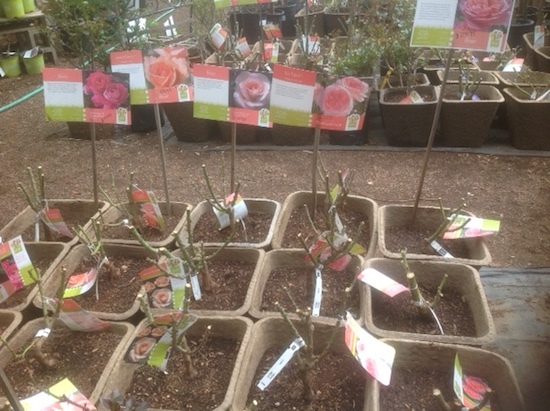 We are busy getting them potted up now so the next few days are your last chance for bare root roses. The trees are still holding up and there is a good selection of fruit trees still available along with several varieties of shade trees. 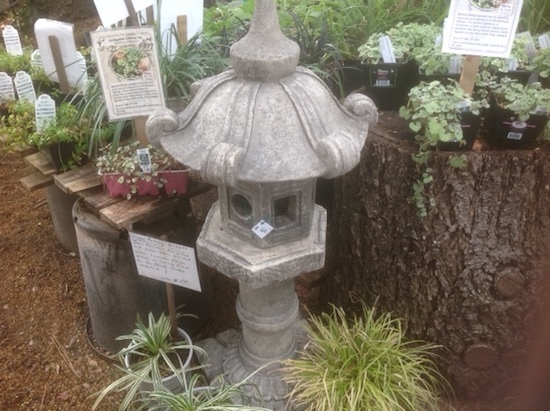 The Art Craft order is here with some real cement statuary including spirit houses, buddhas, bird baths, and animals. We have re-stocked pottery and have to get creative on where we are putting it. Plugs for our hanging baskets are shipping this week and summer bulbs are coming soon. The order from Sester Farms in Oregon is going to ship March 1 and I have ordered a few more unusual things from them to get things not available through our local suppliers. Varieties you might want to look for include Blue Ice Arizona Cypress, Weeping Norway and Blue Spruce, October Glory Maple, Superior White Dogwood, Rainbow Pillar Serviceberry, Black Chokeberry, Blue Muffin Viburnum, Blue Princess Holly, Red Oak, Quaking Aspen, Persian Ironwood and Fairy Lights Arborvitae. More show orders are in route too. Have you seen the new soil product we are trying, Big Harvest Garden Soil in 3 cu. ft. bales? So far it has been very popular due to price and ingredients. It is not a stand-alone product like potting soil but perfect for mixing into new and old beds and boxes. 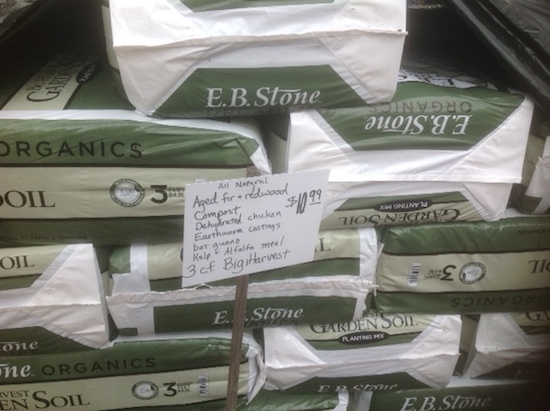 Bags of organic fertilizers went up this year but the boxes are the same price as last year. 4-inch perennials are up, but annual prices are staying the same. We were forced to raise the price on bags of bark. We are often asked the question ‘when do I feed my roses?’ Now is a good time to top dress with Green-All Firmulch (the blue bag) but better to hold off on the rose food until you have 4-5 inches of new growth. Feeding can stimulate growth that can just get fried in the next frost. Top dress your fruit trees too if you have not done this already. If spring is wet peach leaf curl can be a real issue. Spray with copper when two/ thirds of the flowers have fallen off. Never spray (anything) while bees are active. Start tomato, pepper, and eggplant seeds indoors now. Wait on squash and cukes till the end of the month or seed directly in the ground once the soil has warmed up. its okay to plant strawberries, potatoes, and all those cool season vegetables. Love peas? Plant now. Love beans? Wait. Feed your blueberries with an acid food (like for Camellias and Azaleas) or an All Purpose with Green All FST (Iron and Sulfur) food thrown in. So, of course, I can not find the article about the little weed I call London Rocket which had the scientific name and all sorts of common names. (None of which were London Rocket). It said it was the most common weed in the nursery container industry. These little darlings (really they are cute-see photo) have finely cut foliage with a small white flower and I swear are already flowering and setting seed before you can say “I better do some weeding”. Well just imagine my surprise (well maybe not) when the article said each one of the small but mighty plants, or should I say weeds, can produce as many as 5000 seeds. And they explode out of their seed pods. There is a term for this explosive trait but I forget what it is called exactly. Believe me, I have learned to regret thinking any weed is attractive and okay to let it grow for a while. Which brings us to weed control… We do sell an identical product to Round-Up that does not support Monsanto, called Remuda and it is cheaper too. For those of us who want to go strictly organic, we sell an all natural concentrate too but it is pricey. Try this homemade recipe-3 cups white vinegar, 1/4 cup salt, 1tsp dish soap (to spread and stick it). Another recipe calls for 2 cups Epsom salt and a quarter cup dish soap in one gallon of vinegar and another one gallon of vinegar, half cup of dish soap and 1/4 cup salt. Getting the picture? You can also use straight boiling water and avoid any salt build up the former recipes could produce. Salt build-up is also a factor when using chemical herbicides. We love special orders but a lot of time they are unavailable when people ask for them, especially this time of year when last years crop is all sold out and this year’s crop is not ready yet. Keep in mind that we often only order things 5-10 at a time so if you expect to need numbers of anything please give us a few weeks lead time.